The September issue of Vogue has arrived and it’s just getting me even more excited for Spring ‘14 Fashion Week that’s right around the corner. This is always one of the most fun times of the year because it means seeing new trends and getting more designer inspiration for upcoming copycat posts! Woo! I begin a pinning frenzy on Pinterest of things that I can’t wait to recreate after they come down the runway. Before any cutting or sewing begins, the first thing I do with my entire vintage finds is wash them!! My hands get a coat of Purell and my garments don’t leave the bags they come in, before a rinse and tumble. I’m extremely detailed when it comes to getting out spots and keeping my pieces in good shape, so I’m working with Tide Pods today to give my flea market finds a renewed life. 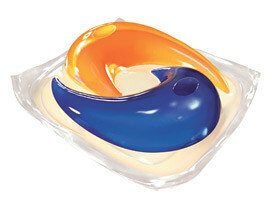 I’m looking forward to my clothes (along with the Tide Pods) popping into the washer and standing out post-wash! They’re a 3-in-1 detergent that cleans, brightens, and fights stains all in one pac which is awesome because it saves me from sorting garments into piles to coordinate with my plethora of detergent options in my linen closet. I also love that they’re small and lightweight just for the fact that I don’t have a washer/dryer in my apartment and I’m usually washing clothes at the Laundromat or at friend’s houses! Tide Pods are way lighter than my gallon containers. ...everything was ready to be worked on! Can't wait to get started! PS, I’m hosting a fab contest if you want to join in on the fashionable fun! (How about that for some chic alliteration?) Just let me know in the comments below what your favorite current fashion trend is for a chance to win a $100 Visa Gift Card perfect for a little shopping spree of your own! This sweepstakes runs from 10/03/2013 - 11/03/2013.